This Tween Tuesday is part of a blog tour for KidzBookBuzz. Tween Tuesday is a weekly meme where I highlight great tween reads. 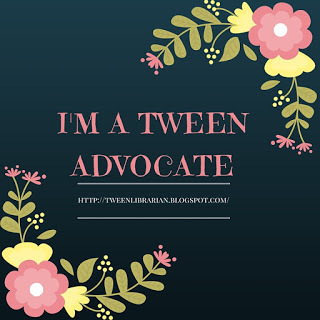 Be sure to add your Tween Tuesday link in the comments! About the Book: Grace's class has a new project-find out about unusual food around the world. Grace decides to research potato chips. Grace finds herself a little jealous when her dad seems more interested in helping her best friend Mimi with her hot dog project than he does with Grace's potato chips. GreenBeanTeenQueen Says: This is the fifth Just Grace book and the first one I've read. The nice thing about the book is that I didn't feel lost, so a reader could pick up any title and jump right in. There are lots of illustrations, because Grace loves to draw, so the book would be great for readers who enjoy the Wimpy Kid books and are looking for other humorously illustrated books. There were a few times that I felt that Grace's wisdom was a little wise beyond her years, but for the most part she is very funny and has some great observations about life that will be sure to leave readers laughing. Grace is perfect for fans of Clementine and Allie Finkle. She somewhat reminds me of a less crazy Clementine-Grace seems not quite as wild, which I think readers who might not relate to Clementines crazy antics will appreciate. Find more about the Just Grace series on author Charise Mericle Harper's website. Here's my Tween Tuesday for today! Have a great holiday season.